Convert Any Videos to HTML5 and Publish Online in Minutes! Convert video to HTML5 MP4, WebM, Ogv. Backward compatible with old browsers. HTML 5 has the ability to easily add video to Web pages with just a few lines of HTML. No < object > or < embed > tags. Basically HTML5 video tag treats your videos as images, < video src="url" width="640px" height="380px" autoplay/ >. Modern popular browsers all support HTML5 videos, Chrome, Firefox, Safari IE9, Opera, etc. You do not have to install any browser plugin or video player, like Flash Player, SilverLight, QuickTime, etc. Your browser is your player. Mobile devices are taking over the world, mobile technology is the future just like HTML5 is the future of the Web. More and more users will be using their mobile devices to view your web site, such as iPhone, iPad, iPod, BlackBerry, Samsung, etc. So get with it! HTML5 Video Player integrates HTML5 video converter function in the software. It can convert almost all video formats and encode them to HTML5 video formats, include MP4, WebM, OGG video(.ogv), that are compatible with all popular browsers. This HTML5 Video Player software also offers basic video editor features, you can preview, trim, rotate, flip and resize your video source files. You can also change the video bitrate, framerate, etc. 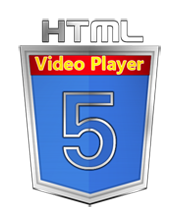 HTML5 Video Player software plays your online video on all popular web browsers. The created HTML5 video player is compatible with all modern browsers, including IE9, Firefox, Google Chrome, Opera, and browsers on mobile devices such as iPhone/iPad/Android mobile/BlackBerry, Nokia, etc. For old version browsers that do not support HTML5, HTML5 Video Player software will fallback to Flash to play your videos which ensures your videos playable on almost all web browsers. Convert Videos to HTML5 Video Format. Encode your video to MP4, WebM, ogv video format in a batch mode. You just need to drap and drop your source video files to the HTML5 Video Converter and Player, it will convert them to the HTML5 video format on your Mac or Windows quickly. iPad / iPhone / Android compatible. Almost all iOS/ Android/ Windows Mobile phones and tablets support HTML5 video playback. Get your website videos playable on all target devices with this HTML5 Video Player. The HTML5 video tool will create a lightweight flash player, so those on an old browser will fallback to play the HTML5 video with the Flash Player. That's meant to allow up to 99.0% internet users can access your online videos. Customizable HTML5 Video Gallery Template. To put your video online is so easy with HTML 5 Video Player software with the built-in video player themes. You can build a web video gallery from one of the video player themes. All video player templates are customizable, you can change the size according to your needs. Click to apply a video player skin, Classic, TED and Windows Media Player. The beautiful video player skins can make your online video players really attractive.